"Michelle Foley, Westbrook College, Class of 1976"
Westbrook College student Michelle M. Foley, Class of 1976, was in the Nursing program and a Day Hop. For her senior class candid photo, which appeared in the 1976 Tower Yearbook, she wore a pale crew neck sweater over a plaid blouse. Michelle's blonde hair curled over her shoulders and was parted in the middle. 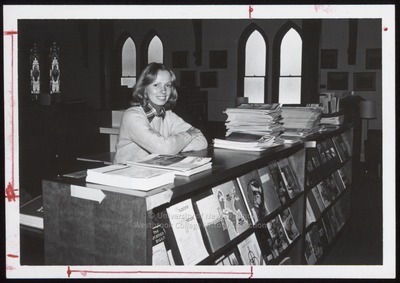 She leans on her arms and elbows on the top of a periodical shelving unit in the Library-in-a-Church.